I've loved doing my nails for as long as I can remember. It's one of those beauty rituals I always wanted to share with my daughter. She's already loving brushing her hair, looking in mirrors and putting on pretend lipstick. Unfortunately, I never found a nail polish that I felt comfortable painting her nails with, because of all the chemicals. I was so excited when I found Kid Licks - an organic nail polish made from vegetable, fruit and other plant ingredients. It is completely safe and even edible! Let's go over some of the questions that may be stirring up in your minds! What are the ingredients? - Each color has a specific list of ingredients based on the natural veggies and fruits needed to achieve its color. The color I have is Beet Red. Its ingredients are: water, organic beets, organic acacia, organic corn starch, citric acid. How long does this polish wear? 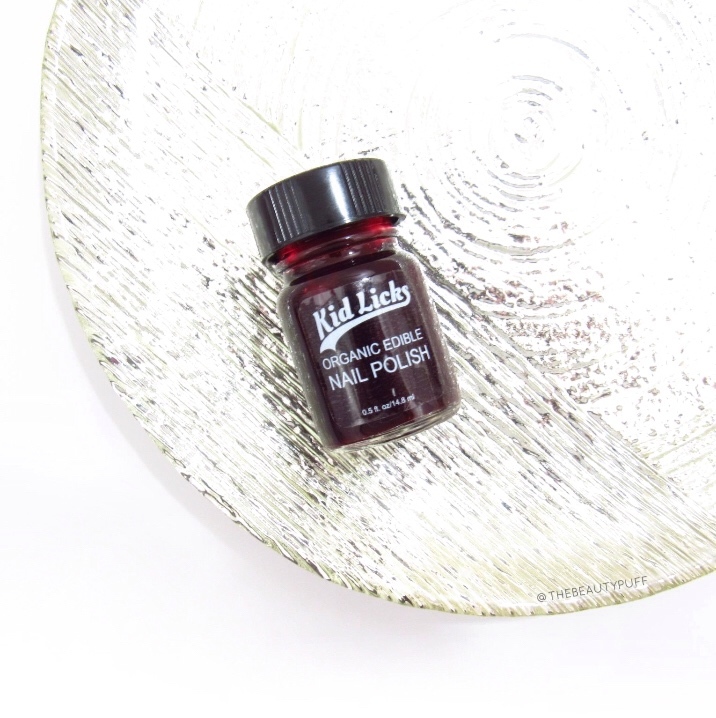 - This polish will last for about a day or so, until you shower or take it off. How do you remove this polish? - This polish can be removed simply with water and by rubbing it a bit. If you shower while wearing it, the polish will melt away. Simply rub it a bit with your finger under the water to completely remove. Will it stain? - As with any polish, yes a stain can happen. Keep away from nicer clothes and fabrics and if it spills, rinse immediately with water to prevent staining. How long will a bottle last? - Once opened, it is recommended that you place Kid Licks polishes in the fridge. They do not contain preservatives, so they will last for about two months. *Keep this in mind when purchasing multiple bottles! What other colors are available? - Currently, Kid Licks comes in Beet Red, Barley Grass Green and and Sour Carrot Orange. Be sure to check back for newly released shades! Itty Bitty Puff was thrilled to make her modelling debut in post! She loves her new polish! I found this polish fairly easy to work with, even though it is quite thick. It seems to get a bit thicker once it is refrigerated, but it easily spreads out on the nails. 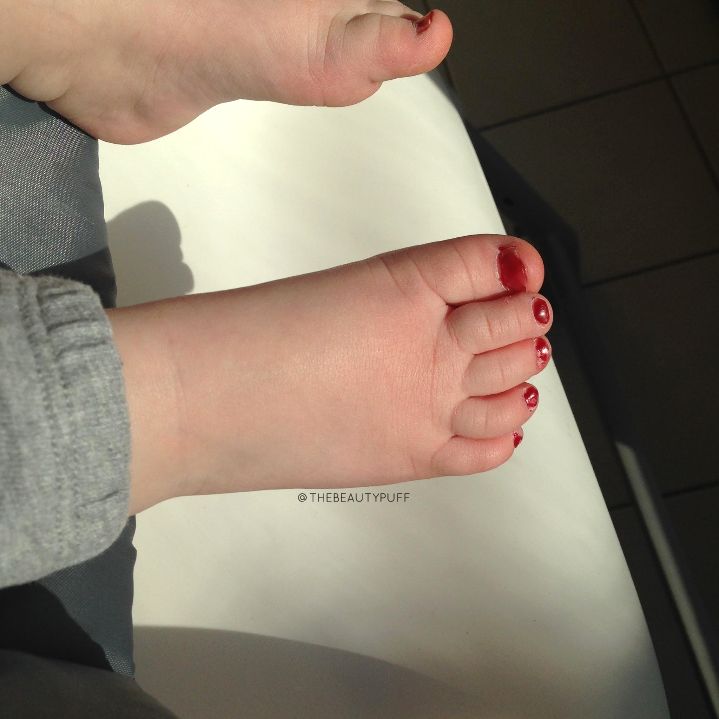 I was grateful for this aspect, especially dealing with wiggly toes. I didn't want polish dripping everywhere! So, will this polish replace your everyday polish? Not necessarily. However, if you are looking for a natural alternative, this is great. It's perfect for little ones and it's a fun way to have kids get involved and be creative while using a safe, natural product. Itty Bitty Puff approved!